The 6ft Sky Dancers® inflatable advertising products from SkyDancers.com is the newest addition to our lineup of Sky Dancer® products. If you're looking for the appeal and performance of the classic 20ft Sky Dancer but in a more compact and life-sized form, you can't go wrong with the 6ft Sky Dancers from SkyDancer.com. Whether indoors to wow your existing patrons or outside your establishment to attract new ones, the 6ft Sky Dancer is your answer for increased revenue. Our 6ft Sky Dancers come in a variety of shapes, colors, and themes to suit your particular business or event. Trust the #1 source of inflatable advertising products with 6ft Sky Dancers from SkyDancers.com. 6ft Sky Dancers® from SkyDancers.com fit those application needs that the 10ft and 20ft Sky Dancer® have a hard time fulfilling, such as at childrens' birthday parties, behind storefront windows, at small gathering, indoor gatherings, and many more. 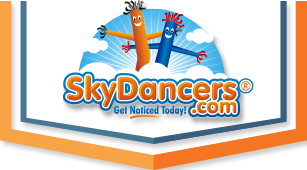 Inspired by a large number of customer feedback, suggestions and comments; SkyDancers.com set out to cater to those customers who needed a more compact and life-sized Sky Dancer while maintaining the successful formula that helped our 10ft and 20ft Sky Dancers® become best sellers. Still made with high-end materials, superior workmanship, and backed by the industry's best pre-sale and post-sale customer support; these 6ft Sky Dancers are ready to reach the same acclaim as the 10ft and 20ft Sky Dancers at your next event or business.